We’re going to look at patterns that typically lead to a reversal in price movement. But first a warning; just because you see a pattern, it does not mean that the price will reverse. When you are betting or trading, you will learn to look for more than one indication before you make a decision, and we’ll look at that idea later. Almost without exception, you need to have corroborating indications before you act on any technical analysis. This comes from the idea that you want to put the odds in your favour, and a confirming indication greatly increases your chance of being right. There are a few principles to bear in mind when interpreting patterns which apply most of the time. One which should be obvious, but probably still needs stating, is that for a pattern to represent a reversal, or for that matter a continuation, you need to have an existing trend to be reversed. Finding the pattern on a chart means nothing if it is not in context. The size of the pattern is also important, because a large pattern tends to be followed by a large move. Some patterns will give you an indication of how large a move you should expect, and often this comes from considering and projecting the size of pattern. A couple of more guidelines –the first sign of a reversal may be the breaking of a trend or other line, as noted in the previous section, so you should include that analysis in looking at the chart; and volume is important and sometimes overlooked in figuring out how significant a pattern may be. If it is not your first time looking at trading, you may have heard of the Head and Shoulders Pattern. It is one of the most well-known chart patterns, and that’s why we are starting with it. Also, once you understand the details of the Head and Shoulders Pattern, it will help you with many other chart patterns. After all, you will find you need to interpret the chart to see the patterns, as you will rarely see a “perfect” example, and you will see how some patterns when they are stretched a little become other patterns. This chart shows clearly the basic elements of the Head and Shoulders Pattern, and you can see that it is a logical extension of what you have learnt about trend lines. The trend is continuing with higher highs and higher lows until it reaches the peak of the head. But the trend line is broken, and the low point that follows may or may not be higher than the previous one, but is certainly below what would be expected if the trend was continuing. The next peak, called the right shoulder, does not get up to the trend line and is also lower than the Head peak. The price continues downwards, starting a down-trend. There are some points to watch for here. The head peak will be higher than the left shoulder, but can be lower than drawn, and not reaching what would be a channel line. Often, you can see a lower volume of trading up to the head as compared to the volume to the left shoulder, and this is another sign that the up-trend is weakening. The decline from the head will go below the left shoulder level, which in other circumstances might provide a support, but it doesn’t have to be below the previous low. In fact, it is common to see the line labelled the Neckline, which connects the two low points either side of the Head, sloping upward slightly as pictured. The peak after the right shoulder may not even reach the Neckline if the down-trend is strong. It’s counted that a down-trend has started as soon as the price drops below the neckline, otherwise the price could simply be entering a sideways trend. Even if the head and shoulders pattern shows a reversal, it is possible for the pattern to “fail”. This would be indicated if the price ran back above the neckline, which it should never do if the reversal is holding. Sometimes you’ll even see the original trend resuming. In this case the pattern results from nervousness in the market. It’s important to look for other signs that the market is ready to reverse. Signs you can look for include volume increasing on the downward price moves after the head, and this confirms that more people are thinking that price should go down. The volume going up to the right shoulder and later peaks should be light. So this explains how we get the head and shoulders pattern from simple consideration of how a price may move when reversing from up-trend to down-trend. But is there any other information that the head and shoulders pattern can give us? Well, as mentioned before, it’s useful if we can project the potential rewards of a bet and there is a way of looking at the pattern to get this information. Perhaps the simplest way is to look how high the head is above the neckline, and take this as the distance the price will drop below the neckline. If the down-trend gets established, then the price may drop much more than this, but this is a starting point for a target. This shows you how the size of a pattern can affect its viability for trading. Bearing in mind that the pattern is not proved until the price drops lower than the neckline, the potential profit from shorting for setting this position is basically the height of the head. You would not be placing a bet until you are confident of the reversal. You should not place your price target solely on the basis of this. It’s important, as with all trading, to consider previous support and resistance levels and if they will figure in the range you’re looking at; and also to look at the 33%, 50% and 67% levels of the major uptrend, if this is considered a temporary retracement. I mentioned above that you can also see the same pattern upside down, and it is not surprisingly called the Inverse Head and Shoulders Pattern. Because it is the inverse, this occurs in a down-trend when there is to be a reversal into an up-trend. It is a fact that most reversals of an up-trend occur more quickly than reversals of the down-trend, so this will generally be a slower pattern. Again, the pattern is made up of three points, this time low points pointing downwards, with the middle one lower than the two side (shoulder) points. 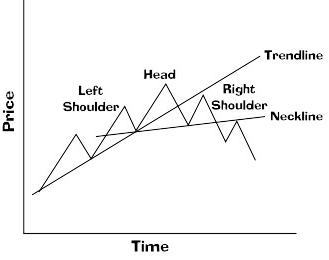 The pattern is considered valid when the price rises above the neckline, which in this case connects the two peaks or shoulders either side of the head. Once again, you can set minimum price targets from considering the “size” of the head – it’s basically the opposite of the conventional head and shoulders pattern. Once more you can look at the volume of trading for some confirmation that the pattern will hold. In this case we are reversing a down-trend and going into an up-trend. Volume in a down-trend is usually not as important as it is in an up-trend, because with very little trading interest the price may still sink – but you certainly want to see increasing volume on the up-trend part of the pattern to show that there is some enthusiasm behind it. You can see many different variations on the head and shoulders pattern – they are usually just degrees of price movement, though some of them are given different names. However the complex head and shoulders pattern is more complicated, as the name suggests. It has extra parts, such as a second head, or another shoulder. This doesn’t have to put you off, as the meaning is the same for the same reasons as we just went through. This time the pattern just means that the trend is taking its time in reversing. You won’t see this sort of thing very often. Here’s an easy variation of the head and shoulders. As you can guess from the name, it’s very similar to the head and shoulders pattern, but the head is the same height as the shoulders, giving three peaks or troughs. It’s quite unusual, because it’s unlikely that all three points will be at the same level, instead of one or two of them being different. If you see it, the interpretation is pretty much the same as the head and shoulders. Now this would be easy to confuse with a sideways trend, because after all you are looking for the price to bounce between support and resistance levels in a sideways trend. Probably the best way to try and anticipate whether this is a reversal or simply the market marking time is to look at the volume of trading. You should see the volume increasing where the price goes in the direction it is reversing to, and the volume fading or reducing whenever the price goes in the original direction. These two indications show that the market sentiment is changing. Even then, you want to see the price break through the short term support or resistance level of the pattern before you can consider it confirmed. You are really much more likely to see a double pattern than a triple, simply for the obvious reason that you can often get two points to the same level, but it is much rarer for the third one to appear at the same price. By the time you identify this pattern, with the second peak at the same height as the first one (on an up-trend), the trend is already starting to break down. If you were to draw a trend line under the low points, then after the second peak the price would drop down through it, breaking the trend-line and showing that the trend is weakening. This isn’t enough to call it a reversal, as it could just be cooling in its up-trend and entering a period of sideways movement or consolidation. This is not what we are looking for, as you want a firm reversal of trend to give you the maximum opportunity for profit. So it’s usual to wait until the fall in price from the second peak goes below the previous low point in order to get a further indication that the trend is switching. Because of the way it looks on the chart, this is also sometimes called an “M” top. You can look for similarities to the head and shoulders analysis too for confirmation. For instance, you will be looking for volume clues, such as a lessening volume going up to the second peak, and increasing volume as the price falls. The opposite of this is called the double bottom, or “W” bottom because of its shape. All the comments above regarding confirming the reversal apply, except in reverse. In looking for a double top or double bottom, if the two peaks or troughs are not exactly level it is a stronger indication if the second peak is already going in the other direction, i.e. lower than the first. Obviously, if the second peak is higher, even though it may not reach a channel line drawn on the chart, is still showing that the up-trend is trying to continue which it may do it instead of reversing. As mentioned with the head and shoulders pattern, you can look at this pattern to try and establish a price target. In this case you would consider the price height from the low point between the two peaks up to the peaks. You then project that downward from the low point to give yourself an idea of where the price should go. Once again, you get a better indication if this happens to be an existing support level, or there are other indications confirming this price. There are several other shapes that you will see when trends reverse. They’re not as common as the ones we’ve already looked at, and they’re a little more difficult to discern. But I hope you’re beginning to see that there is nothing magic, but just common sense and knowing how to read a chart to finding patterns. They are simply diagrammatic illustrations of the way we expect the market to perform. Yet they provide a shorthand way of spotting potentially profitable moves. Sometimes you will see spikes in the price chart. It’s basically a sudden move in the opposite direction without all that coming and going of the head and shoulders. There usually has to be a reason for this that you will see in the charts or in the news – if there wasn’t, then you shouldn’t expect the reversal to continue. The spike can happen because there’s a news item – someone being sued, or someone making a major discovery – that changes the way people look at the company. Alternatively, sometimes there will be some built-up tension in the way the price has been developing. This could come from a rash of irrational enthusiasm for a particular stock. Perhaps Jim Cramer featured it on his show. The price develops on no real basis, and at some stage everyone comes to their senses and it reverses suddenly, giving a spike pattern. In this case, you should be able to see from the indicators, which we will look at later, whether the price movement is well supported or a “fake” move. The other type of reversal pattern you may see is the opposite. The “rounding bottom” is a simple saucer shape, gently changing from a down-trend it to an up-trend over a long period of time. It’s of no interest to us, because that’s not the sort of chart that gives us trading opportunities. But it does happen. The idea of spotting a reversal pattern is that you can trade as soon as practical on a reversal. You have to balance the risk of the reversal not happening against the desire to get your trade on as soon as you can. For that you need to develop a sense of the market you’re trading.